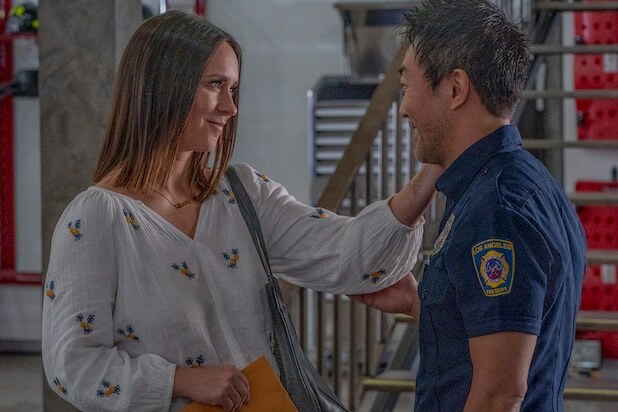 “9-1-1” returned after a long hiatus Monday night with an episode that stabbed fans right in the gut in its final moments — when Chimney (Kenneth Choi) got stabbed right in the gut. Just when it seemed he and Maddie (Jennifer Love Hewitt) were going to finally make things official with their first real date, her estranged, abusive husband, Doug (Brian Hallisay) — who has been secretly trying to locate her and buddying up to Chimney by hiding his true identity — attacked Chimney in front of her apartment and left him for dead. Right after Maddie had finally summoned up the courage to send Doug the divorce papers, too! And while we know you are probably dying to make sure that he’s OK — and not, you know, dying — “9-1-1” showrunner Tim Minear tells TheWrap there will be a pause before you find out Chimney’s fate and what happens to Maddie after Doug busts through her door and knocks her out. “We want you to be worried for a little bit,” the Fox first-responder drama’s chief said. OK, so we can’t promise you Chimney lives, but the guy had a piece of rebar jammed into his head and survived — so we’re hoping he can make it through a knife to the stomach too. Meanwhile, Minear told us what else to expected in the backhalf of Season 2, including a “heist” episode called, “Ocean’s 9-1-1” and one installment where they are sent back to the Stone Age — technologically speaking. And then yet another origin story, but this one gets to the heart of Peter Krause’s Bobby. Fine, as long as Chimney is OK.